A proposed rule by the Trump Administration threatens the health and safety of immigrants, their families and their communities. A “public charge” is an individual who is deemed “likely” to become dependent upon government assistance for basic needs like food, shelter and health care. In the context of immigration, the risk of being deemed a public charge could prohibit an immigrant from being eligible for a green card. The proposed rule significantly expands the types of social service programs whose use would characterize immigrants as “public charges” and, consequently, make them ineligible for a green card, deny them entry to the U.S., or result in issuance of a deportation order if they are already here. Medical, nutrition, housing and educational programs are created with the idea of providing safety and security for children and families. If individuals and families forego, for example, seeking medical attention or getting immunizations or screenings for fear of being branded as a “public charge,” that creates a potential health crisis. At our hospitals, we have already seen how heavy-handed ICE enforcement has adversely impacted the immigrant community as individuals refrain from seeking health care for fear of being arrested and deported. This proposed rule is another means of striking fear in immigrant communities and causing them to refrain from utilizing basic social services. When medical and social programs initiated to keep children and families safe and healthy are not used, the entire community suffers. 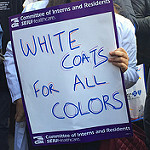 As physicians, we denounce this rule and ask you to take a stand with us. Every human being deserves to be treated with dignity and respect and should never have to choose between basic human needs and staying in this country. We can make a difference. Make your voice heard now, share your story to let the administration know that this rule is wrong for our patients and the communities we serve.